Elizabeth Taylor, Complete Short Stories. Virago Modern Classics, 2012. There are more than 60 stories in this wonderful collection, and nearly every one is a gem. I may have to post separate pieces to try to do some of them justice; for now I’ll just give an overview and first impressions, using just the opening story as illustration. Elizabeth Taylor (1912-75) surely no longer merits the adjectives often used of her in recent years: underrated, overlooked. Several book bloggers whose opinions I value have praised her novels highly. I was given Mrs Palfrey for Christmas, and intend reading it as soon as my backlog has reduced. I picked up the Complete Stories with a view to dipping in occasionally, but found myself hooked from the start, and couldn’t stop until I’d read the lot. The opener, ‘Hester Lilly’, is the longest in the collection (53 pp. ; most are much shorter, some just a couple of pages), and one of the best. It introduces several of the themes and scenarios found in many of the other stories: a bourgeois couple, Robert and Muriel – he’s head of a small private boys’ school, she (like so many of Taylor’s female protagonists) doesn’t work – have a childless, emotionally sterile marriage. Their complacently dull life is wrecked with the arrival of young Hester, a cousin of Robert’s. She’s an impressionable, romantic young woman and has developed a crush on him that he reciprocates. The story shows with forensic acumen the self-destructive impulses that take each character into dangerous, desperate situations. She had not learnt how to mind less than as a little girl at parties – the panic of not being chosen, the first seeds of self-mistrust. Her thin veneer of social sophistication is stripped away to reveal a different person: lonely, frustrated, frightened. Hester, the young house-guest, in her innocence has thrown Muriel’s moral state and her empty marriage out of equilibrium, and uncovered the poisonous corruption beneath the surface. He got neatly into bed and lay down, as far from her as he could, his back turned. The prose is always lucid, her style sinuous and elegant. It’s not extravagant or florid, but the apparent simplicity and understated clarity are deceptive: they convey unerringly a complex of emotions and tensions in these seemingly smug, uneventful provincial households. The dialogue is pitch perfect., as I hope these extracts show. Her childlessness makes her feel ‘panicky’; she wants ‘to go back, be different, have another chance.’ But life doesn’t offer such bonuses. All she can do is cultivate her prickly outer shell and make people feel as awkward as she secretly does. ‘I cannot make him come to me,’ she thought in a panic. ‘I cannot get my own way.’ She became wide awake with a longing for him to make love to her; to prove his need for her; so that she could claim his attention; and so dominate him; but at last wished only to contend with her own desires, unusual and humiliating as they were to her. I commend these stories to you: Elizabeth Taylor is a fine writer. 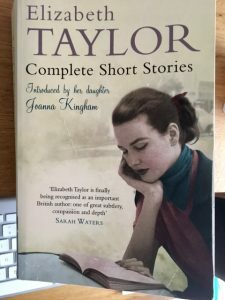 This entry was posted in English Literature and tagged Elizabeth Taylor Complete Short Stories, Virago Modern Classics by Simon Lavery. Bookmark the permalink. I’ve read all of Taylor’s novels and they’re often darker than you might expect. She really can pin down difficult human emotions. I’ve yet to embark on the stories (though I do have a copy of the collected volume) and it sounds as though they’ll live up to the standard of the novels. Karen: yes, I’ve been following your posts on her novels, but as I’ve yet to start on them have only skimmed. Enough to pick up your enthusiasm. Some of these stories are remarkably dark and bleak. There’s humour as well, though – but existential angst is very much her thing. I love Elizabeth Taylor so much. Her short stories are so good, that I have saved two volumes ( I have the complete collection and the single volulmes) to look forward to. Heater Lily is a brilliant story. So pleased you enjoyed these. So many brilliant observations in those 60+ stories. Thanks for picking out Hester Lily. Caroline: I hope to return to some others one day. It is an excellent mini novel, Hester L.
I am trying to save Taylor’s stories for a while, probably until I’ve read another couple of novels. As such, I’m going to keep your review and come back to it then as I’d rather know as little as possible about stories beforehand. As a fan of her work, I’ll be interested to see how her short fiction compares. I love her stories and did the same, reading through them all (I have the print volume but read them on Kindle as it’s quite unwieldy!). I had The Blush already so I skipped that one in the volume, but have read it more than once. I love her adolescent girls and there wasn’t a story I didn’t like in the whole collection. I also probably want to read a couple more of her novels first, but this does sound fantastic. The only thing that puts me off is that it’s a collected works. I tend to find that a bit daunting and prefer individual short story collections, but they’re often harder to find. Not surprised to see your comment that she’s on firmer ground in her middle class comfort zone. Max: I agree that it’s not usually a good idea to plough through a Collected Stories like this – but they became an addiction. In retrospect I’d have done better to dip in, as you suggest. They did tend to blur into each other by the end. On the other hand it provided a perspective that perhaps wouldn’t be achieved reading them in parcels. Intriguing to think the earliest were written decades before the final ones. They style was consistently luminous.